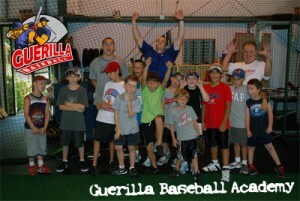 Guerilla Baseball Academy will have its summer baseball camps in July and August of 2010. We will email everyone the dates when we have them. The hold up is that Brent Pourciau is going to be a father this week so we are waiting to see when he will be available after the new baby arrives. Please wish Brent and his wife Tracy best of luck with the birthday. If you have not notice we are using a new service to run our newsletter. We implemented the new service just yesterday the 1st of June. If you have not signed up for the newsletter within the past few days please sign up now to receive all of our alerts at Guerilla Baseball Academy. This new email service will keep you more up to date on our instruction and Guerilla events. You have the option to unsubscribe at any time and we will never give out your information. After you signup please help support Guerilla Baseball by inviting your friends to sign up as well. Thank you all for your support and we look forward to hosting our summer camps.